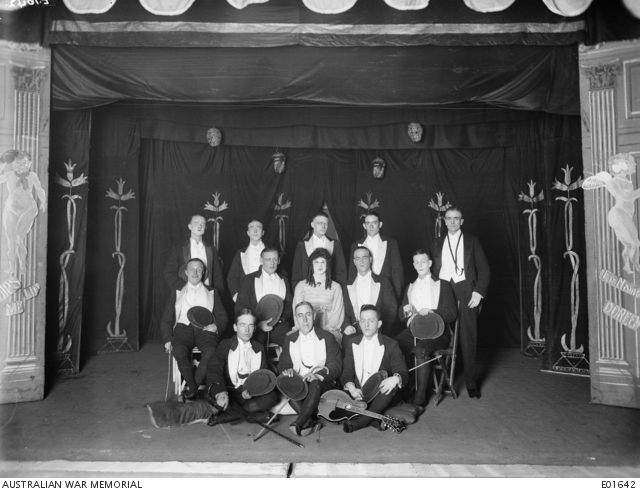 Group portrait of entertainers from the 1st Divisional Concert Party onstage at Bailleul, France. Identified from left to right, back row: Lieutenant (Lt) Wesley Mervyn Blake MC from Roseville, NSW; 16701 Corporal (Cpl) Hopetoun Horace Stevens from Hawthorn, Victoria; 5021 Driver (Dvr) Roy Morris Harding Smedley from Paddington, NSW; Sapper (Spr) A. F. Lossen; and 6487 Sergeant (Sgt) William Josiah Baldock Goodall from Balmain, NSW. Middle row: 5052 Private (Pte) Daniel Cerise from Sydney, NSW; Lt Douglas John Walsh MC from Adelaide, South Australia; 1619 Pte Victor Kemble from Sydney; 338 Dvr Roy Catterson Glenister from Footscray, Victoria; and 109 Pte Henry Charles Marter from Paddington, NSW. Front row: 6237 Pte Henry Matthew Crowe from Wyee, NSW; 16561 Spr Walter Reynolds from Parramatta, NSW; and 5028 Pte Alfred Arthur Anderson from Paddington, NSW.